Joe Kovach of Entomology, who is studying the best ways to grow food on old asphalt parking lots, is giving free monthly tours of his test plots this summer. The tours, which are aimed at urban farmers in Cleveland, Columbus, and other cities, are covering two main points: "The basic ecological principles involved, and that you can actually do this," Kovach said. "People say parking lots are barren,” he said. "But you can get more production off of a back parking lot than you ever thought you could do." Kovach is growing apples, peaches, green beans, blueberries, strawberries, raspberries, tomatoes, and more in an asphalt parking lot behind an old, closed dormitory at ATI in Wooster, which adjoins the OARDC campus. He's testing several methods: in pots and in raised beds sitting on top of the pavement; in pots suspended on wire mesh fencing, a form of "vertical gardening"; in beds set in trenches cut right through the asphalt; and all three ways both inside and outside of high tunnels. The plantings are now in their second full season. 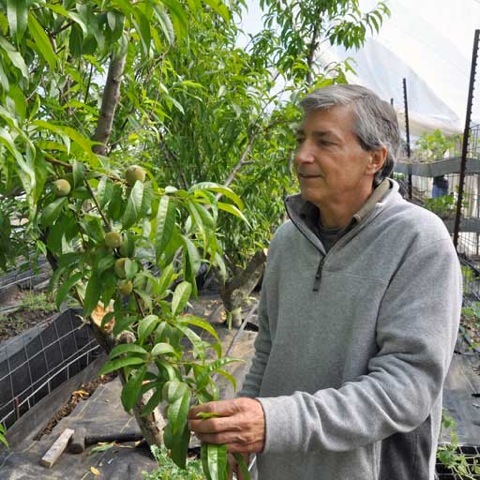 A late May visit showed big, healthy-looking blueberry bushes full of just-forming berries; apple trees with trunks thicker than a person’s arm growing in pots the size of a Jacuzzi; and peach trees pushing right up to the roof of their high tunnel. The remaining tours are on July 26 and Aug. 30, both at 4 p.m. at 1427 Dover Rd., Wooster. Video (1:21): Joe Kovach discusses the tour series at his urban farming "parking lot" garden.